“From a Distance“ is a song written in 1987 by American singer-songwriter Julie Gold. Gold was working as a secretary at the time for Home Box Office and writing songs in her free time. Gold’s friend, Christine Lavin, introduced the song to Nanci Griffith who first recorded it for her 1987 album, Lone Star State of Mind. It quickly became a favorite of Griffith’s fans around the world. The song also became subject of many interpretations with the most famous being the Bette Midler version. 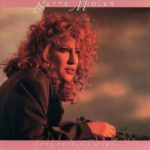 The song became an international commercial success after it was recorded in 1990 by Bette Midler for the album Some People’s Lives. “From a Distance” went to number one on the Adult Contemporary chart and peaked at number two on the Billboard Hot 100. The song went on to win a Grammy for Song of the Year in 1991. The song also won a “3 Million Airs Award” from Broadcast Music Incorporated. Bette Midler re-recorded a Christmas version for her 2006 Christmas album, Cool Yule, with additional lyrics by Los Angeles native Jay Landers. Additional recordings of the original have been performed by Gold, Griffith, Simon Nicol (of Fairport Convention) and many others. Much of the song’s popularity coincided with the first Persian Gulf War. The song’s parent album, Some People’s Lives, peaked at number 6 in the Billboard 200.